Don’t fear the space reaper. As the writer William Edward Hickson never said: if at first you don’t succeed, try a bigger laser. When you die in Everspace you’re dead. But money earned carries over and can be spent on upgrades, which means you’ll be more powerful for your next run through the cosmic gauntlet. And these perks keep adding up, allowing you to travel deeper into space, and more boldly, with every successive attempt. It’s a compelling loop, and when I die I’m never frustrated: just excited to start again, wondering how far I’ll make it this time. It helps that the ships are such a delight to fly. This isn’t a weighty, complicated sim like Elite Dangerous. It has more in common with an arcade shooter, with forgiving, responsive flight controls and fun, immediate combat. I can’t help but think of Sega classic After Burner when I play it in third person, although you can select a cockpit view if you’d prefer. The weapons feel fantastic too, particularly the scatter gun, which is essentially a shotgun designed for space dogfights. The violent explosion of glowing, red hot shrapnel when you fire it is hugely satisfying, reminiscent of Unreal Tournament’s mighty flak cannon. More superficially, Everspace is astonishingly pretty. Powered by Unreal 4, its dazzling starscapes, hulking freighter wrecks, and burning alien suns make every moment worthy of hitting the screenshot key. And developer Rockfish knows it, including an option to toggle the HUD and a photo mode that freezes the action and lets you spin the camera freely around your ship. And when you take damage you see cracks, scorches, and dents on your pristine spacecraft, giving you instant visual feedback on just how close to death you are. The first time you die, you unlock an achievement called Welcome to Everspace. This is the game telling you that death is something you’re going to have to get used to. But there are ways to keep the grim reaper at arm’s length. It’s possible to scavenge materials to repair your ship, whether it’s the integrity of the hull or a subsystem that’s out of action like your weapons or shield generator. This brings a survival element to the game, and there’s a thrill in limping to the next sector in a battered ship, moments from death, only to find some nanobots lurking in an asteroid belt and repairing yourself back to full health. But if you’re really busted up, sometimes it’s better to just ram into the nearest space rock, kill yourself, and start a fresh run. I find myself doing this a lot when I’m backed into a corner. Rather than try and fight my way through a swarm of enemy fighters with a depleted shield or a malfunctioning ship, I just hurl myself into something heavy until I explode. 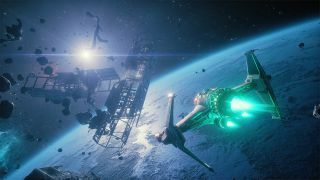 You’ll enjoy Everspace more when you let go of any sense of ownership of your vessel. It’s a disposable tool, and the next iteration will always be better thanks to a steady stream of perks. These include boosting your chance of scoring a critical hit, improving your sector scanner so more resources and points of interest are visible, and increasing the amount of credits you earn. And with every run these upgrades continue to pile up on top of each other, which gives you a palpable feeling of increasing power and progression. You can even increase your standing with a faction who lurk in most areas until they like you so much that they’ll jump into a battle if they see you get in trouble. It’s a deceptively deep game, and only gets more rewarding over time. There’s crafting too, and any blueprints you find will carry over to your next life. Not to mention an entertaining, non-linear story to follow and space exploration between combat encounters. It’s a great example of a roguelike, and the persistence makes even a bad run feel like it wasn’t a complete waste of time. You’re always improving, which makes each life a little easier and a little more fun. And there’s an unpredictability to the game that makes each run feel wildly different. But even if you just want to fly around in space and shoot things, and don’t particularly care about the progression stuff, that’s fun too.